Valentine's Day is fast approaching and many of you are still looking for that perfect gift. Is it flowers? Chocolate? How about jewelry or dinner reservations? Every year, countries around the world celebrate the love holiday with different customs. For example, in Japan it's the women who give chocolates to the men. In Finland, Valentine's Day is more about remembering your friends. The SkyPlanner Partners found out that last year Salesforce's Radian6 or Salesforce Marketing Cloud (it was bought by Salesforce for $326 million) had a case study about the February 14th celebration. 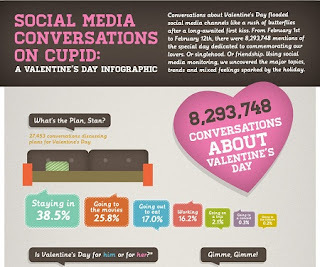 So the social media monitoring platform giant posted a Valentine's Day infographic with plenty of data surrounding February 14, 2012. Your Miami Salesforce Consulting company learned that from February 1 to the 12th, 2012, there were 8, 293,748 mentions of Valentine's Day dedicated to lovers, singlehood and friendship. By using social media monitoring, the Salesforce Marketing Cloud was able to report a bunch of trends and mixed feelings about Valentine's Day. For example, your Miami Salesforce Consulting company learned that 27,453 conversations were discussing the actual plans for the night out. Of those, 38.5% said they were saying, 16.2% said they were working while 0.3% were going to a concert. As far as the gifts are concerned, 12,005 conversations discussed perfume, 18,746 discussed lingerie, 84,340 discussed candy and of course 105,115 discussed roses. SkyPlanner Partners found out 74% of women were having positive conversations surrounding Valentine's Day while only 26% of men were having positive discussions. When it came popular dating sites, Eharmony had 564 mentions beating out Match.com's 408. The Salesforce Marketing Cloud was also able report back on the most romantic city in North America. New York City took the number one spot with 1,030 mention, Las Vegas took the last spot with only 172 mentions. Your Miami Salesforce consulting company discovered Twitter was also part of the study with popstar Avril Lavigne scoring one of the top 5 tweets. She announced her February 14th concert in Beijing at the Mastercard Centre. My baby was the top term of endearment during the love holiday with 20,020 mentions while my love bug only had 1,073 mentions. Tune in later, your SkyPlanner Partners will keep report back on this year's Valentine's Day social monitoring.